Half of me wants to write Part II as another factual reporting on the events which occurred when Jason Rheinstein was blackmailing me. Same as the first article. The other half of me wants to write this using curse word conjugations in ways which you have never heard, using phrases that would make your eyes bleed. If you want to hear me curse in creative and imaginative ways, then you can come out to Frederick and we can have a beer. If you want the facts, you can read on. After the blackmailing events in Part I, Jason Rheinstein continued with his gross misconduct for another few weeks. So much so that the Board had placed his expulsion on the agenda for the next meeting. That’s when two more people joined the fray. Specifically, Diana Waterman and Joe Cluster. The following e-mail was sent on Tue, Jul 14, 2015 at 10:46 AM. Obviously, I did not record the conference call. I was actually down in Arlington for work that evening, so I took the call from a parking lot down the street from my companies office. 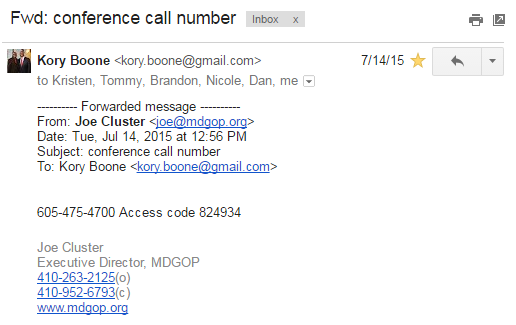 During this call, we discussed the “agreement” described in Cluster’s e-mail to make this entire fiasco go away. 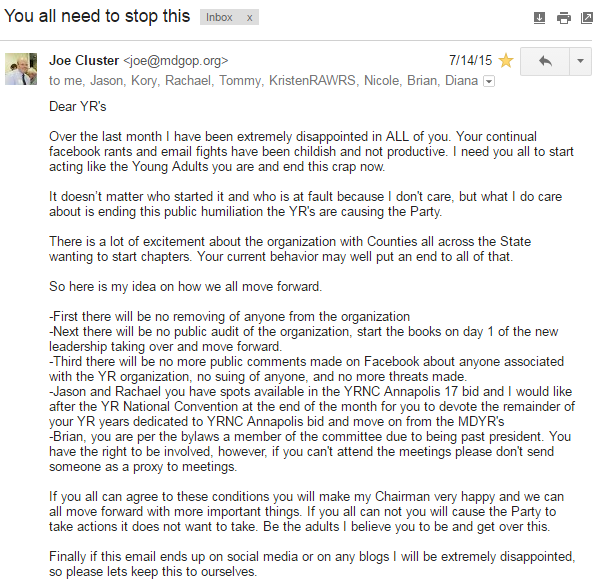 The Chairwoman and Executive Director of the Maryland Republican Party did not care that I was blackmailed. They did not care how it affected my family. They did not care about what was right or wrong. So what did they care about? They were more concerned that Jason Rheinstein helped Republican candidates with their legal filings and that the party did not have to deal with negative PR. The two people in charge of the Maryland Republican Party decided that party volunteers blackmailing other party volunteers in order to create favorable votes is just the cost of doing business, as long as the offender fills out a few sheets of paper for a candidate or two. Let me ask you, since many of you donate and volunteer for the Maryland Republican Party. Is that the kind of people you want to send your hard earned money to? Is that the kind of people you give up your nights and weekends to help? Just think about it, because I am not the first person to go through this, and unless you do something to stop it, I will not be the last. After the call, the MDYR board discussed the matter amongst ourselves. If you want to know their position, you can ask them. I’m sure they will be honest with you. You might also be wondering why this is being posted early. Well, it turns out that someone illegally obtained my expunged case file and is showing it to people within the Republican party. You see, there are only three people that have that file. Howard County, my former attorney, and me. In whatever manner that case file was obtained, a crime was committed. Part III will be naming the names of the scumbags who keep trying to control me through my past. That comes out tomorrow night.